Who can refuse a slice of delicious, warm, buttery, garlicky bread definitely not me my mouth is watering now. Garlic bread makes a great starter, side dish or anytime snack. It is simple to prepare with few ingredients and a great favourite with children who will love to help you make it. The taste is so much better if you use your own home grown Garlic. The smell and taste is absolutely gorgeous. Enjoy! To me Garlic is the taste of the Mediterranean but it can be grown in the UK so why not have a go at growing your own instead of buying foreign grown bulbs from the supermarket. Garlic is an easy and undemanding vegetable to grow making it ideal for children, with tactile and nicely sized cloves to plant. I am sure they will want to plant it once they know it’s the main ingredient of garlic bread. Garlic is a fantastic ingredient in cooking, add at the beginning for a milder flavour or later on for a stronger taste. As well as having a lovely and unique flavour it has many health benefits too, being a recognised superfood it has been shown to lower blood fat and cholesterol levels, help reduce blood pressure as well as combating bacterial, fungal and viral infections. Garlic is rich in Vitamins C and B6, carbohydrates, and fibre and is also a good source of several of the essential minerals, zinc, calcium, magnesium, phosphorous, and potassium. 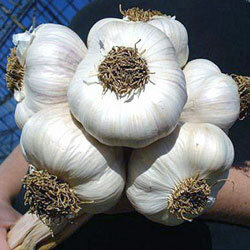 Garlic can be planted in Winter or Spring. Spring planted bulbs should ideally be planted no later than the end of March in order for them to mature so get your bulbs ordered now, supermarket bulbs are not recommended as the chances are they have been grown in a warmer climate and will not thrive in our British weather thus giving a disappointing crop. Garlic takes up very little room and can even be planted between flowers, in window boxes or containers but will need to be watered often in dry spells. Garlic needs a sunny position in well drained soil, to prevent waterlogging and feed the soil dig in plenty of well rotted manure or garden compost, they are ideal for growing in raised beds especially if your soil is particularly heavy. Split your garlic bulbs into individual cloves immediately before planting, make a hole with a dibber to avoid damage to the base of the bulb and plant approx. 2cm below the soil surface, 10cm apart, leaving 15-20cm between rows. Cover with fleece to protect from frost and also to stop birds from pulling them out (until they are established). Water during dry spells and keep weed free. Harvest when the leaves turn yellow, loosening the bulb underneath with a trowel taking care not to damage the bulb. Place the bulbs somewhere warm and dry and they can then be stored for up to 3 months. So why not give them a go before it’s too late. We have four delicious varieties to chose from all suited to the British Climate, Solent White, Vigour, Germidour and Elephant.